Can V2110 work in vmware workstation? If yes, can you please share any config resources? I have a V2110 installed in my Macbook Pro (i7, 16 BG RAM) using Fusion, so I guess it is possible to run it in Workstation. I haven't done much testing, other than connecting an AP and letting the controller discover and adopt it. Remember this is NOT a supported configuration, and it is not meant to be used in production. But if you want to practice or do a quick lab, it will probably work. Thanks Daniel, If its working in Fusion pro it should also working in Vmware player. I have tried with player, but I have had hard time connecting esa0 and esa1 ports with existing network. Do you have any vmware networking config resources to get data ports up? I am having a esxi installation already working. But vmware workstation/player is for demo purposes only. I haven't done anything special to connect the controller to networks. For some reason I am not able to connect v2110's esa0. But in the same config I was able to use C25. Must be some kind of vmware player config issue. Can you Pl post your switch config. It worked. Thanks for the help. But I hope there are some bug. If I run installation wizard, esa ports are not working. 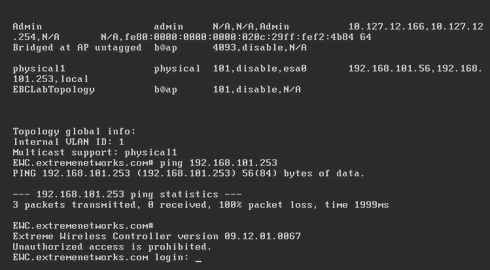 But if I do CLI based topology config and avoid initial installation wizard, its working.